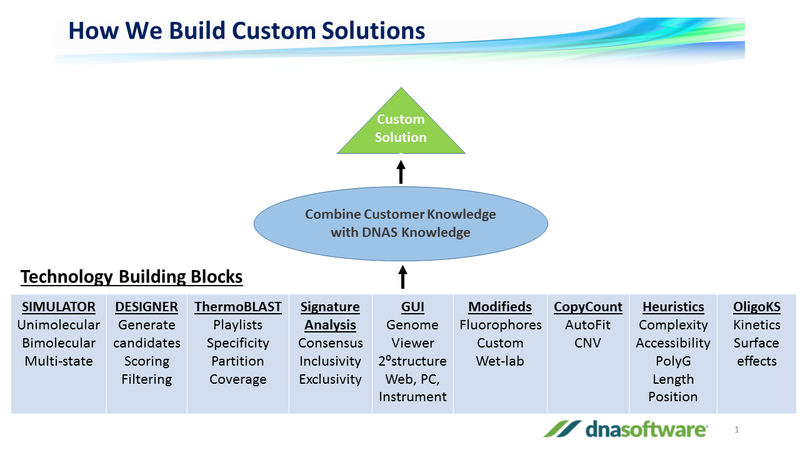 DNA Software is the preferred partner to analyze your diagnostic design and analysis problems. We build customized software platforms or in some cases provide the diagnostic solution to our partner. Alternatively, we can help you to use our tools to solve your toughest challenges. Over our 15 years in business, we have provided custom software design platforms for some of the most challenging assay platforms including LDA (ligase detection amplification), isothermal amplification and microarrays as well as provided custom multiplex assays STDs, viral panels, human disease as well as multiplex assays for biodefense applications. DNAS Designer: is the oligo design engine for our cloud applications. Proprietary algorithms developed by DNAS accurately predict the folding and other properties of the candidate probes and primers that it generates. This crucial information enables our cloud software to rank and select from the best candidates for each application. As Designer reveals the design “sweet spots” within target secondary structure, the applications can choose the most sensitive and specific probes and primers for its needs. DNAS Simulator: is the experiment simulation engine for our cloud applications. Its proprietary folding algorithms developed by DNAS accurately predict the behavior and interactions between oligos and targets under your experimental conditions. This allows the cloud software to predict and avoid undesirable outcomes such as unwanted secondary structure or oligo to oligo mishybridization, which is vital for selecting the best solutions. Heuristics: DNAS captures expert knowledge in the form of algorithmic rules or strategies to effectively identify the best solutions, filtering these from the vast sea of possibilities. Modifieds™: DNA Software™, has assembled the world’s most comprehensive thermodynamic database of modified nucleotides ( see full list of DNA Software Modified nucleotides) through a series of NIH grants and has incorporated these parameters into our simulation and design of oligos. This is a unique capability in the industry and is essential to solving some of the most challenging and complex design problems. ThermoBLAST™,: scans oligos across collection of genomes to detect all false positive hybridizations and amplicons, resulting in better specificity of assays. DNA Software employs ThermoBLAST to capture any unintended hybridization and to ensure the highest quality designs. To learn more about how ThermoBLAST can help your organization. OligoKS™: The Oligo Kinetics Simulator, OligoKS™, predicts rate kinetics from sequence and represents a breakthrough in our understanding of Oligonucleotide hybridization kinetics and competing unimolecular folding. important to several assay formats including fast cycling PCR and microarray probe hybridization. CopyCount: turns every qPCR reaction into an absolute PCR determination, without the need for a standard curve, and without changing instruments. CopyCount saves money by reducing reagents costs, number of replicates, and laborious standard curves.